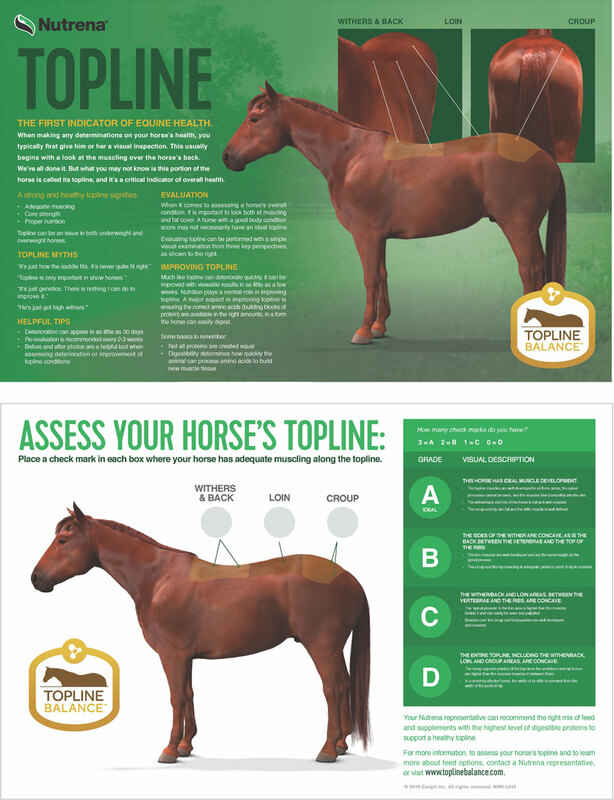 Educating Horse Owners on Topline Health. In 2015, Cargill Animal Nutrition’s U.S. equine business wanted to educate horse owners on an entirely new concept regarding equine nutrition. Cargill partnered with Padilla to separate fact from fiction amid a sea of industry misconceptions. A horse’s topline, the muscles along its back and rear, are critical to helping the horse look good, feel well and perform to the best of its abilities. For many horse owners, equine veterinarians and others in the horse community, a horse’s topline “is what it is,” while others have been sold on myths to improve topline – like more exercise or changing saddle fit. Together with Padilla, Cargill Animal Nutrition launched a program to educate horse owners and veterinarians about its research connecting nutrition, topline health and the role specific feed formulations play in targeting a horse’s topline. The campaign began with research to help us understand horse owner perceptions about topline, how they make feed decisions, who they look to for information and more. Following the research, we launched Topline Balance™, a new way for horse owners to identify feed containing topline-improving benefits. Cargill and Padilla executed an integrated campaign, complete with industry-leading ideas, including the creation of a custom three-dimensional digital horse, to build awareness and, ultimately, drive demand for Cargill equine feed. Since launch, the horse community has made big strides in acknowledging and understanding nutrition’s impact on topline. Product sales saw a notable increase, as well. All SKUs in the Topline Balance™ line saw a sales increase of 3 percent compared to the previous year. A flagship product within that portfolio, Empower Topline Balance, saw a 40 percent increase in tonnage sold compared to the previous year, following a product refresh that included a new formulation and new name.